I was planning to do a nice reveal of the new artwork for ‘Bryant & May: The Lonely Hour’, which is coming to you on March 21st, but my publisher beat me to it by putting the art on Amazon. But I have a nicer, bigger version, and the original sketch. 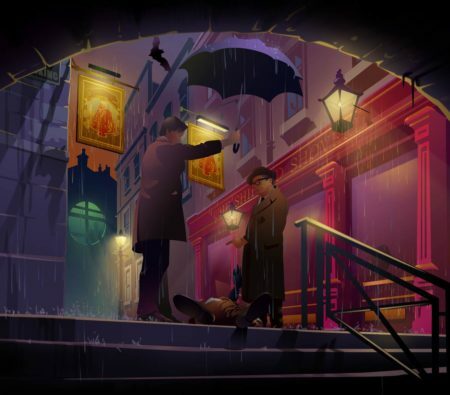 The story takes place just after Christmas, after the events of ‘Wild Chamber’, and is set in some nicely atmospheric London locations, including this spot. The bats in the drawing have been reduced now, but they’re there for a reason – they feature at the site of the murder. The cover artist, Max Schindler, has a vivid sense of colour and has done a fantastic job, although we’re getting him to make Mr Bryant a bit older, as he seems to be ageing backwards, morphing into a young Shaw Taylor (one for those with long memories). Londonheads will of course know exactly where this is set. There’s a bit of artistic licence going on here, too, as the end of the alley is different and there’s no dead body on this spot in the book. I think of it like those Superman covers that showed the old Kryptonian with the head of an ant or something, then said inside, ‘This scene fancifully rendered on the cover’. I think that apart from ‘The Burning Man’ this is my favourite cover of the series so far. Let me know what you think. And if you don’t know what this one’s about, here’s the Amazon outline for you. On a rainy winter night outside a run-down nightclub in the wrong part of London, four strangers meet for the first time at 4:00am. A few weeks later the body of an Indian textile worker is found hanging upside down inside a willow tree on Hampstead Heath. The Peculiar Crimes Unit is called in to investigate. The victim was found surrounded by the paraphernalia of black magic, and so Arthur Bryant and John May set off to question experts in the field. But the case is not what it appears. 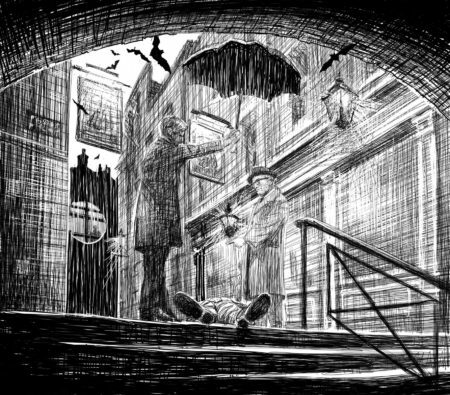 When another victim seemingly commits suicide, it becomes clear that in the London night is a killer who knows what people fear most. And he always strikes at 4:00am. In order to catch him, the PCU must switch to night shifts, but still the team draws a blank. John May takes a technological approach, Arthur Bryant goes in search of academics and misfits for help, for this is becoming a case that reveals impossibilities at every turn, not least that there’s no indication of what the victims might have done to attract the attentions of a murderer that doesn’t seem to exist. But impossibilities are what the Peculiar Crimes Unit does best. So excited can’t wait to read it! Hi Chris, that’s an excellent cover.The Burning Man still stands as my favourite Bryant And May novel. Throw me off the site if you like…if it’s raining, then bats are furred so don’t fly in rain. But will it appear as a character? The bat is a nice artistic touch echoing the curved structure in the background, the umbrella and bringing the eye back to the drama; likewise the use of May’s umbrella to emphasize the tunnel. And I like the perspective–either the reader coming upon something unexpected or the evil doer hiding, watching, in the tunnel. Amazon blurb definitely needs a rewrite with a strong editorial hand. Favorite covers UK editions only: London’s Glory and Strange Tide; depictions of Bryant & May bring to mind Calder & Behrens on original 80s covers. Arthur’s pudginess (London Glory) is endearing. Super Stuff! Can’t wait till ‘Drop Day’ to come round…. Er Thats all wrong, It meant to be Can’t wait for ‘Drop Day’ to come around. Sorry me no speak the English too good!!! I’m just so excited. Who needs Christmas when there is the promise of a New B&M? Ace. Just what I need! Brooke – Perhaps, the bat is dashing home to his family and can just make it before being to soaked to fly? I love a reader who can quote a Calder & Behrens cover! The London’s Glory art was based on an old photograph I found of Regent Street in 1952, far more glamorous and sumptuous than it is now, with its Disney-branded decorations. As I pointed out above, this is a Superman-style cover that condenses several features into a single image. I think only one bat will remain in the final A/W. Oh, and Brooke, I don’t throw readers off the site for opening a Socratic dialogue. On a point of pedantry, following Brooke, the largest English bats have a wingspan of about 15 inches. What Brooke said (although I’m not so sure about the bats) but it is sure to be one of my favourite covers for sure and with that plot outline what is not to love? I mean *love*. A sudden piece of news: the city of Edmonton Alberta has a stretch of road on which there are 228 street signs in 15 blocks, about 15 per block. And you complained about London’s street furniture. Well, if this turning into a size of our bats competition I’ll mention the bats that fly over my house of an evening. They (Pteropus poliocephalus) have a 1 metre (about 39 inches) wingspan as adults and are lovely to watch on a moonlit night as they fly slowly and soundlessly across the suburbs. Note that Brian is apparently in eastern Australia. According to the article (which has been curated by apparently appropriate people) these bats are on a watch list as decreasing in numbers. I would love to see these which are part of that “flying fox” group of bats. The loveliest part of summer evenings. Ah,the Ship and Shovel, not easy to say once you’ve had a couple. A hostelry so convenient for Charing Cross too. I like the location. I think it was in “The Victoria Vanishes” Mr Bryant added a list of London pubs he did his research in, I think that should read Christopher . When ever my wife and I visit London which is quite often as we live close by we try to visit at least one of the pubs on the list, however they are not all open at the weekends , including the Ship and shovel. We are not even half way through and some have disappeared ! but its worth the effort when find one . Perhaps the mystery is: how did Pteropus poliocephalus get from Australia to England, and now they’re here, what do they eat? Or perhaps Max Schindler got a little carried away. Perhaps pteropus poliocephalus spends its time in the glass houses at Kew where flowers would be available at this time of year. The rest of the time they flap from park garden to park garden as the flowers change, co-existing with hummingbirds (easy to do since the birds are diurnal). …or they may have disguised themselves as ring-necked parakeets, Helen. “Keep ’em Peeled” I think was his catchphrase? Just a quick thank-you note, Christopher. My copy of Full Dark House has to be my favourite cover, as it now turns out it is a rare(?) “misprint. You kindly autographed it for me, via my friend Damien Bilton, so it is now one of the treasured items on my bookshelves! Took me a few moments to work out what the mistake in the artwork actually was. I guess i wouldn’t make a useful contribution to the PCU with detective skills like that. Having fun re-reading the start of the B&M books. Funny, I noticed the references to the Spice of Life, this time around, as I used to be a regular in the Backstage Bar (strangely located in the basement?) for the Wednesday Jazz nights (run by the excellent Paul Pace)…which recently had it’s 20 year celebrations. Nice that there is somewhere that you can still see great jazz music on a regular basis. Also, featured as the location for a “Death by Jazz Vampire” in the second of Ben Aaronovitch’s Rivers series. That’s one thing I do miss, these days, as i moved to France a 18 months ago, so i don’t get to go there any more. If you like a bit of Jazz, definitely a place to go! Anyway, enough wittering. Thanks again, and looking forward t the next instalment in the continuing saga of B&M! The problem with the ‘Swallows and Coconuts’ conversation in ‘Monty Python And The Holy Grail.’ is that African swallows and European swallows are just the same birds at different times of the year. And once again the readers of this site prove – if more proof was necessary – that a conversation can veer from pubs to bats to Shaw Taylor. I cannot see anywhere else to leave a contact message so this is not strictly about the new book. Recently I was out of authors of mysteries–everyone had either released their latest (Sara Paretsky, Laurie King, more) or decided never to write again (Margaret Maron, Deborah Crombie, others). I had just finished Peter Lovesey’s latest Peter Diamond, John Robinson’s new dark story, and raced through an Ian Rankin. Louise Penny wasn’t ready yet, nor LJ Ross–books pending. It was a desert and I must read a mystery a week, minimum, for my sanity. BUT–lamenting to my local librarian in early September, she took me to an aisle and drew out “Strange Tide.” Had I never heard of this author? Well, I was in for a good ride, she said. I took the book home, liking the cover by Sarah Coleman, and read, on the first page, May announcing that the teabags were sentient, for they had their own website. I laughed and was hooked. Now I have read, since then, all of them except the first one and the Burning Man one (I so get wary of anything about that festival–conjures up such scary ancient rites) and the short stories, plus the one I am reading this minute. The libraries in the region share the titles so I never did get to read them in sequence–but you say somewhere it doesn’t matter and you’re right. Now I am in the middle of “Bryant and May on the Loose,” which the libraries at last found for me, and once more I leave behind worries and newscasts and the chaos of the world–albeit Bryant’s chaos is daunting. And just writing to say of course this book does work as a standalone, but it is very hard to read continuously. For example, on page 116 of the hardcover edition, Bryant says “Right, this is King’s Cross during Mesolithic times.” “Dear Lord, do we have to go back that far?”asked May. I could not read on. I was in stitches. Every time I tried to read the rest of the paragraph, I couldn’t get past those lines. For five minutes I stayed that way. How wonderful you are to give us such delight, for this sort of thing happens often in the series. I am so enjoying this book–and discovering even more of London in minute detail. Grand. You see, readers? This is how to defrost the crusty cold heart of the curmudgeon author. The delightful Ms Regina Clarke is valiantly reading all the B&M books, for which she deserves some kind of merit badge. True, she’s getting them from libraries but let’s not judge. Perhaps the NEW NOVEL HALL OF MIRRORS out in the US will force her patience and make her gallop to Barnes & Noble. I lent one to a bloke at work, and he read it, badgered me for the next one, and kept leaving post-it notes asking if I was anywhere near the end of the last one. I tried to stave him off by lending him ‘Rune’, ‘Hell Train’, and ‘Plastic’, but he roared through those over a weekend. The post-it notes reappeared until at last, I let him have ‘Wild Chamber’. Why didn’t he buy his own? He’s not on the internet, and our local Waterstones doesn’t seem to stock your books, which is a pain in the toches, actually.